The naming ceremony of the Bibby WaveMaster 1 took place on September 6, at the cruise terminal in the Port of Rotterdam in front of more than 125 guests from the U.K.-based Bibby Group, Damen and a range of industry partners. More than 10 members of the Bibby family attended while the Damen family was represented by Chief Commercial Officer Arnout Damen. 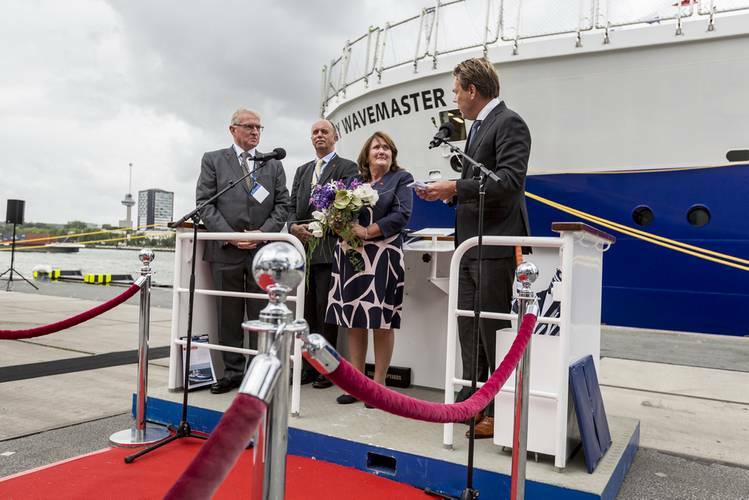 The naming, by Lady Sponsor Jacky Blaikie, is the culmination of a program that began nearly four years ago to develop a vessel that could meet the needs of the offshore wind industry in an efficient, economic and environmentally-responsible way. The Bibby WaveMaster 1 is the first of Damen’s new class of purpose-built Service Operations Vessels (SOV) with Walk-to-Work (W2W) capability. 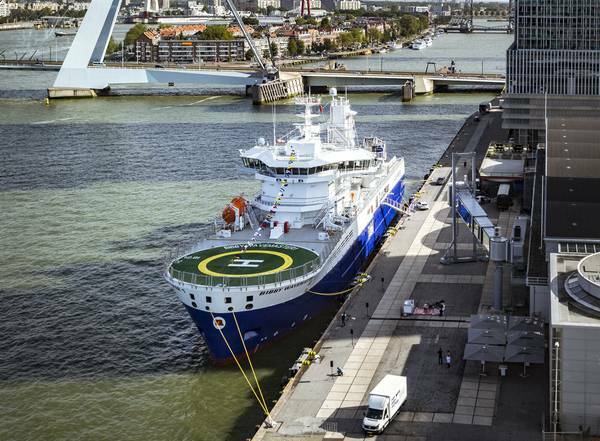 The Damen Group identified the need for such a vessel in 2013 following consultations within the offshore renewables industry and launched a research program that set out to develop an entirely new concept from the ground up in cooperation with a number of key suppliers. The design that came out of this process combined DP-2 and a new motion-compensated gangway with an innovative hull design, a revolutionary internal layout, and a comprehensive range of additional innovations designed to increase efficiencies and reduce costs. In January 2016, Bibby Marine Services and Damen signed a contract for the building of the first of the new class, steel was cut for the first time just weeks later, and the new build was officially launched at Damen Shipyards Galati on March 24, 2017. 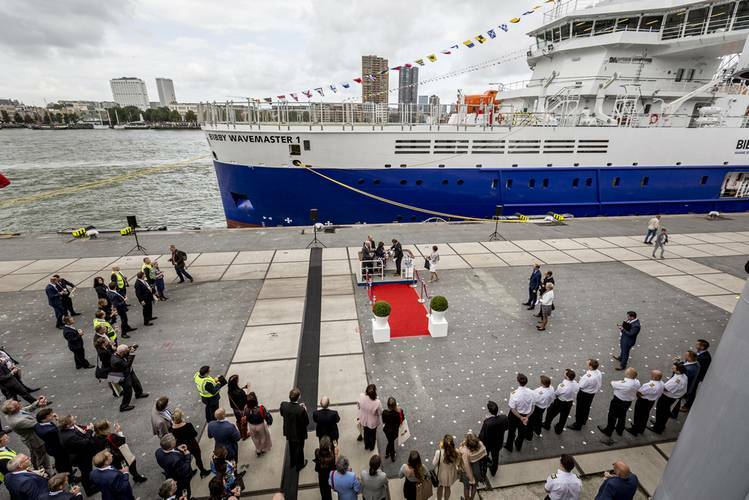 In his speech to the assembled guests, Arnout Damen noted the shared longevity of the two, family-owned, companies totaling 300 years; 210 for Bibby and 90 for Damen, and the fact that the values shared by both organizations underpinned the success of the project. He then went on to describe the evolution of the SOV design and the critical role that Bibby played in it, before handing over to Stephen Blaikie, CEO of Bibby Marine Services. The speeches were then followed by lunch and guided tours of the vessel to show its many unique features.